Too many in our world are searching for validation – for love, self acceptance, confidence, and how to feel good enough. I used to be one of those people. Here are some questions with the answers to help bring you more awareness and simplicity in creating pure, unshakable self love. Love of Self is simply a view of Self. If you view yourself with a great deal of compassion, and suspend all judgment, then replace that judgment with understanding, and compassion, you will come closer and closer to love your authentic self. So many people have taken on the views of others during their earlier years, and have not learned how to replace those views with the pure truth. The way to do this is to immediately stop insulting yourself, cutting yourself down, and degrading yourself. You have to bring all of the small insulting lies that you tell yourself up to your conscious awareness. People that love themselves do NOT degrade themselves. I wouldn’t dare degrade YOU, so please immediately stop degrading yourself, and come to embrace your unique qualities. You chose those qualities and attributes for your unique contribution in this world. Honor what makes you “different” because that is your unique Light that you are on this Earth to shine! Treat yourself the way you wish someone else would treat you, and always give yourself a heartfelt hug for the sacred person that you are. How can I feel like I don’t need approval and validation from anyone else anymore? Once you start to honor what feels true for you in your heart, and simply go for it without even speaking about it to anyone else, you will come to feel a great measure of inner confidence that grows each time you honor what feels right to you in your heart – not your head, or your fears, but in your heart. Why is it so hard for me to love myself? It is hard because no one ever taught you how to honor yourself, your preferences, your talents, abilities, strengths, inner gifts, and areas of self expression that are uniquely yours. So if you were never taught how to do something, why are you being so hard on yourself? Now, all you really need to do – which is actually quite simple, is to tell yourself every good quality you have on the inside in front of the mirror, each day, based on your observable actions. Begin a dialogue to become friends with the person you see every day. So if you fed your pet, that is being caring. If you called a friend that is going through a hard time – that is being compassionate. If you went to work so you can pay your bills – that is being responsible. So you are to walk up to that face in the mirror, and as hard as it will be for your ego to do this dialogue, what will happen is that you are slowly, day by day, going to become your own best friend. You are going to feel more self-appreciation. You are going to feel more care for yourself. This mirror process truly works! I have taught it to countless people over the last decade, and I also had to go through it myself for over two years, every day, to chip away at the lies I was told growing up, and replace it with authentic truth, based on my observable actions, so my big ego would actually believe me. Trust that there will be fierce resistance to this from your ego in the beginning. I actually cursed at myself my first time in front of the mirror over a decade ago. I wouldn’t dare curse at myself now! I can attest that every single person I teach this to, and share this with, now loves themselves genuinely. The ego is melting away, along with the self-degrading lies. If you really want to love yourself, the old beliefs must be transformed. It is like cleaning out an inner closet with an old belief system, and replacing it with authentic truth. No one can give this to you but you. No one can love you and make you feel lovable. You have to know and believe you are lovable. This is just one technique that cost nothing, and brings about astounding change every single time. What can I do to really feel happy inside? First, do the mirror technique that I outlined above twice a day, for two years. Then, imagine that you have a clean slate before you – called your life – and that there was a guarantee that if you followed your truth, you could NOT FAIL. The only things that make me feel happy are when I am with my children, when I am giving my private consultations and intensives, writing (this for you : )) working (in absolute JOY) on inspire! magazine, going out in nature, doing my hobbies, really enjoying the night sky, or a sunset – they are simple pleasures. Being with friends and laughing – that’s something we could all use more of! Bringing through information from Divine Source in my writings – I love every minute of it! I love to travel (sometimes) and there is so much in life that I love. So I create time to do it all during my days and nights. I had to CREATE my life, no one gave it to me. For me, personally, there is no greater joy than when I am making a difference – that’s why I love the work (joy) that I do so much! Many times I am volunteering and do NOT get paid for my work – like right now. And I still love it just as much as if I was paid ten thousand dollars for the few hours it takes to put this together. You came into this life for a purpose. The key is to find out what that purpose is, so you CAN move in that direction, and live your life in-joy! It is then that you will be doing everything that will make you happy, because you will be living from the inside out, rather than looking for an answer from the outside in. Why is it so hard for me to take a compliment? Probably because you are so used to taking insults. I was there too! If someone complimented me I would say: “Oh, that’s not true.” Because what I really wanted was more validation. I then learned a simple technique that actually changed that. I learned to simply say Thank You. For the first dozen or so compliments, it was really hard for me to do that. Then, I began to feel more comfortable accepting a compliment. NOW, I learned NOT to take a compliment seriously at ALL – because it is based solely and completely on the views of another person, and what is in their mind – which has nothing to do with me! Additionally, I don’t take an insult personally either – how freeing! I can be completely open to constructive critique, such as when I’m working on a project, however, I no longer take it into the core of my being like I used to. Just say “Thank You” when someone compliments you, and should anyone ever insult you, just know that it is coming from their own perceptions, and never take it seriously. Moreover, people do like to express their views. So if someone does share their views with you, just know that they are entitled to them, and maintain your own view of self with a lot of loving compassion, and zero self-judgment – that is the key! When you really love and value yourself, in a genuine way – without all of the ego, you will come to trust your feelings and perceptions. You will instinctually “know” if someone is for real or not. The trick here is are you being real with yourself, or are you playing games with yourself, and not following your own truth? How can I know if someone loves me for who I am? Trust your feelings, and get your head out of the way. Move more into your heart center and dare to expose how you really feel – even if it just to yourself. You will find that when you are completely honest with yourself, and the feelings in your heart, you can then learn to trust what you are picking up from other people. You will trust yourself, and you will be able to follow what feels true for you. You will also know if someone really does or does not love you – you will know – once you come to know and honor what you feel inside fully. of everything you will ever need? competition is a complete waste of time and energy? soon take the place of confusion? are lovable? Worthy? And Needed? Start to replace fear with trust. an important purpose behind everything. Your life carries that important purpose. And you still believe it? Based on your observable actions? I used to despise myself. The lies I was told growing up. Self talk in place of the negative lies. Negative thoughts that you still believe about you. You simultaneously transform how you view yourself? It’s true! And guess what happens next..
Just for being who you are inside. By finding everything that’s RIGHT with you! 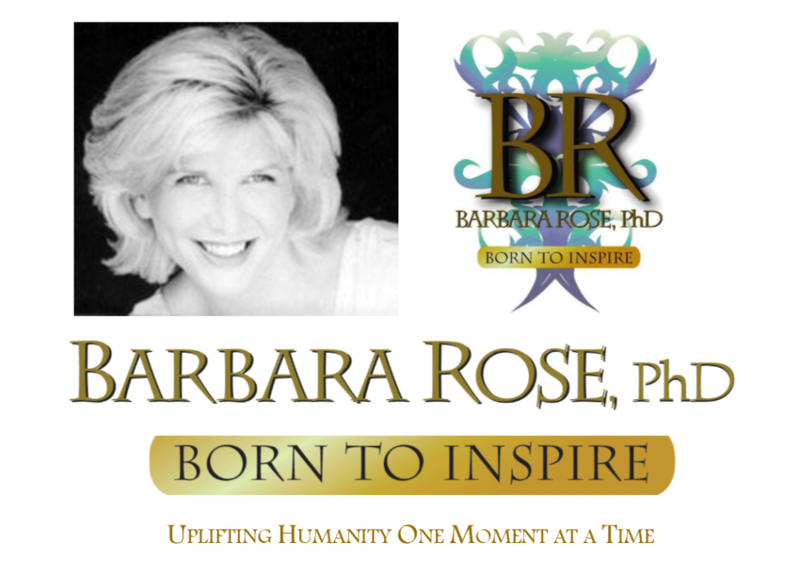 © Copyright 2007, 2012 Barbara Rose, PhD All Rights Reserved. You’re about to take 100 steps forward? That you couldn’t see before. The rough times were worth it after all. up, sarcasm, —all of those tactics do not work. process, you will experience inner peace. away and will never come back. it felt like heaven on earth. it out or cry it out. And we wonder why we’re feeling pain! are here to bloom and experience your greatest self. and go outside to feel the spring breeze and sunshine. get out calmly and quickly. this moment, while we simultaneously look ahead. that you can refer back to whenever you need it. your relationship, force yourself to focus on right now. When you start to hear old love songs, change the station. go to together, drive in the opposite direction. needy cause or throw the shirt in the trash. disguise just waiting for you if you tap into your creativity! once dumped and how they turned their lives around. Excerpt re-printed with permission from the book Get OVER Him FAST © Copyright 2009 by Barbara Rose, PhD All Rights Reserved Published by The Rose Group (September, 2009) ISBN-10:0978895568 ISBN-13:978-0978895563.